The Farrelly Brothers have plagued film critics with stupid comedies like Dumb & Dumber To, Hall Pass and Stuck on You for years. In his first solo venture, Peter Farrelly gives drama a go and the results couldn’t be more rewarding. Green Book slid into the 2018 Toronto Film Festival as an afterthought, but emerged as a serious awards contender with pitch-perfect performances that play to both smart comedy and deeply affecting drama. The original screenplay showcases a beautiful friendship that some have even called a modern-day inverted version of Driving Miss Daisy. The true story comes from actor Nick Vallelonga based on a screenplay he wrote about his father. Oscar-nominated Viggo Mortensen (Captain Fantastic) might deliver his best performance to date, a role that plays into his untapped comedic versatility. A reputation for knowing how to push people around is exactly why Tony Vallelonga (Mortensen) is perfectly suited for his job in snazzy local New York City bar. When the club closes for renovation, Tony Lip as he likes to be called, lands a job driving famed musician Dr. Don Shirley (Ali) into the deep south for an 8-week tour. “Just be home for Christmas,” his wife Delores (Cardellini) insists. The two men couldn’t be more opposite and a white man driving a black man from New York to Alabama in 1962 causes quite a bit of controversy with each stop. It’s an eye opener for Tony to meet someone who is refined, educated and talented. The two eventually become friends after some major societal roadblocks and Shirley not only teaches Tony how to write letters and speak properly, but he administers dignity through example. 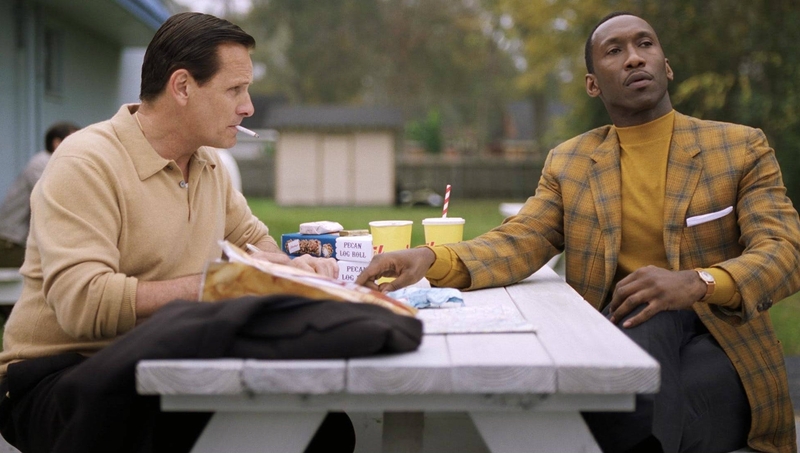 Green Book has the potential to bring audiences together in a way other films and award contenders lack. Green Book is exactly the type of film we need right now. Equal parts entertaining, I haven’t laughed this hard in years, with a message of different sides coming together to understand one another. Ali hasn’t been seen much on screen since winning his Oscar for Moonlight, but he comes roaring back in a performance that may equal his previous achievement. Both actors play something very different than we have seen from them before, Mortensen is firing on all cylinders with a physical transformation. Green Book is an endearing film with a message you see coming a mile away, yet like Hidden Figures or The Help, it has never felt more necessary. It’s the type of film anyone and everyone can enjoy and it never sacrifices integrity for a punch line. “Kentucky Fried Chicken in Kentucky!,” Tony exclaims, upon seeing the first interstate sign for the fast-food chain. “When is that ever going to happen?” The comedic timing of the script and Mortensen’s performance will put everyone in a good mood, but it’s the story you are left with that gives Green Book it’s lasting power and repeat-ability factor. Farrelly has tapped into something timely and decent compared to the stuff he’s normally involved with. Green Book has the potential to bring audiences together in a way other films and award contenders lack. A crowd pleaser with enormous heart and conviction. Two of the years best performances!